PLEASE READ THE FOLLOWING TERMS AND CONDITIONS CLOSELY BEFORE USING OUR WEBSITE. By accessing, browsing and using this website, you acknowledge that you have read, understood and agree to comply with the terms and conditions stated herein. If you do not agree with any part of these terms and conditions, you must not use this website. The terms “we,” “us” and “our” refer collectively to LABROS RESTAURANT and “you” and “your” refer collectively to the individuals using this website. We reserve the right to change these terms, conditions and notices, and you agree to accept and be bound by such terms, conditions, and notices that are in effect at the time of your use of our website and facilities. Material from www.LabrosRestaurant.gr and any other World Wide Web site owned, operated, licensed, or controlled by LabrosRestaurant.gr or any of its related, affiliated, or subsidiary companies (together, “LABROS RESTAURANT”) may not be copied or distributed, or republished, uploaded, posted, or transmitted in any way, without the prior written consent of LabrosRestaurant.gr EXCEPT: you may download one copy of the material on one computer for your personal, non-commercial home use only, provided you do not delete or change any copyright, trademark, or other proprietary notices. Modification or use of the materials for any other purpose violates Labros Restaurant’s intellectual property rights. The material in this site is provided for lawful purposes only. If you download software from our site, the software, including all files, images, contained in or generated by the software, and accompanying data (together, the “Software”) are deemed to be licensed to you by LABROS RESTAURANT. Neither title nor intellectual property rights are transferred to you, but remains with LABROS RESTAURANT, who owns full and complete title. You may not resell, decompile, reverse engineer, disassemble, or otherwise convert the Software to a human perceivable form. THE INFORMATION, SOFTWARE, PRODUCTS, AND SERVICES PUBLISHED ON THIS WEBSITE MAY INCLUDE INACCURACIES OR TYPOGRAPHICAL ERRORS. ALMYRA DOES NOT GUARANTEE THE ACCURACY OF, AND DISCLAIMS LIABILITY FOR INACCURACIES, RELATING TO THE CONTENT OF THIS WEBSITE. CHANGES ARE PERIODICALLY ADDED TO THE INFORMATION HEREIN. LABROS RESTAURANT MAY MAKE IMPROVEMENTS AND/OR CHANGES ON THIS WEBSITE AT ANY TIME. NIOEL MAKES NO REPRESENTATIONS ABOUT THE SUITABILITY OF THE INFORMATION, SOFTWARE, PRODUCTS, AND SERVICES CONTAINED ON THIS WEBSITE FOR ANY PURPOSE, AND THE INCLUSION OR OFFERING FOR SALE OF ANY PRODUCTS OR SERVICES ON THIS WEBSITE DOES NOT CONSTITUTE ANY ENDORSEMENT OR RECOMMENDATION OF SUCH PRODUCTS OR SERVICES BY LABROS RESTAURANT. ALL SUCH INFORMATION, SOFTWARE, PRODUCTS, AND SERVICES ARE PROVIDED “AS IS” WITHOUT WARRANTY OF ANY KIND. LABROS RESTAURANT HEREBY DISCLAIMS ALL WARRANTIES AND CONDITIONS WITH REGARD TO THIS INFORMATION, SOFTWARE, PRODUCTS, AND SERVICES, INCLUDING ALL IMPLIED WARRANTIES AND CONDITIONS OF MERCHANTABILITY, FITNESS FOR A PARTICULAR PURPOSE, TITLE, AND NONINFRINGEMENT. LABROS RESTAURANT IS NOT LIABLE FOR THE ACTS, ERRORS, OMISSIONS, REPRESENTATIONS, WARRANTIES, BREACHES OR NEGLIGENCE OF ANY THIRD PARTY PROVIDER OF PRODUCTS OR SERVICES FOR ANY PERSONAL INJURIES, DEATH, PROPERTY DAMAGE, OR OTHER DAMAGES OR EXPENSES RESULTING THEREFROM. LABROS RESTAURANT HAS NO LIABILITY AND WILL MAKE NO REFUND IN THE EVENT OF ANY DELAY, CANCELLATION, OVERBOOKING, STRIKE, FORCE MAJEURE, ACTS OF TERRORISM, SICKNESS OR OTHER CAUSES BEYOND THEIR DIRECT CONTROL, AND THEY HAVE NO RESPONSIBILITY FOR ANY ADDITIONAL EXPENSE, OMISSIONS, DELAYS OR ACTS OF ANY GOVERNMENT OR AUTHORITY. IN NO EVENT SHALL LABROS RESTAURANT BE LIABLE FOR ANY DIRECT, INDIRECT, PUNITIVE, INCIDENTAL, SPECIAL, OR CONSEQUENTIAL DAMAGES ARISING OUT OF, OR IN ANY WAY CONNECTED WITH, THE USE OF THIS WEBSITE OR WITH THE DELAY OR INABILITY TO USE THIS WEBSITE, OR FOR ANY INFORMATION, SOFTWARE, PRODUCTS, AND SERVICES OBTAINED THROUGH THIS WEBSITE, OR OTHERWISE ARISING OUT OF THE USE OF THIS WEBSITE, WHETHER BASED ON CONTRACT, TORT, STRICT LIABILITY, OR OTHERWISE, EVEN IF LABROS RESTAURANT HAS BEEN ADVISED OF THE POSSIBILITY OF DAMAGES. You agree to defend and indemnify LABROS RESTAURANT and any of its or their officers, directors, employees and agents from and against any claims, causes of action, demands, recoveries, losses, damages, fines, penalties or other costs or expenses of any kind or nature including but not limited to reasonable legal and accounting fees, brought by: (i) you or on your behalf in excess of the liability described above; or (ii) by third parties as a result of (a) your breach of this agreement or the documents referenced herein, (b) your violation of any law or the rights of a third party, or (c) your use of this website. You are not permitted to create a link to LABROS RESTAURANT’S website without first obtaining LABROS RESTAURANT’S prior written consent. The following trademarks used herein are owned by LABROS RESTAURANT: LabrosRestaurant.gr. 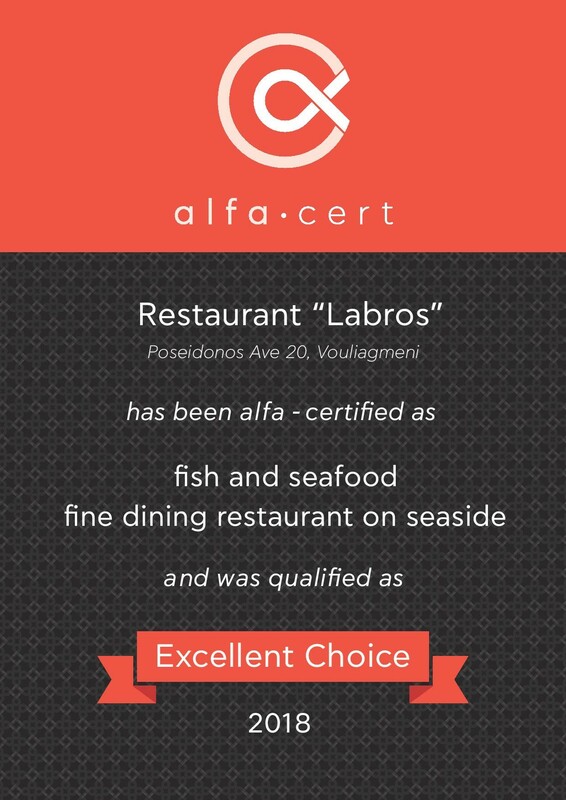 By using this website or booking a reservation through this website, you agree that the internal laws of Greece, without regard to the principles of conflicts of laws, will govern this agreement and any dispute of any kind that arises between you and LABROS RESTAURANT. You hereby agree that any dispute arising from or relating to the use of this website, restaurant reservations and/or purchasing goods or services made through us may, if not amicably resolved, be resolved only through binding arbitration between you and us under the rules of Greek law. This arbitration, which shall be conducted in Athens before neutral arbitrators, will result in a decision that shall be final and binding, non-appealable and subject to entry in any court of competent jurisdiction. This arbitration shall not involve other customers, be combined with separate arbitrations involving other customers, or proceed as any type or form of class action in which the claims of similarly-situated customers are pursued together. Use of this website is unauthorized in any jurisdiction that does not give effect to all provisions of this agreement, including, but not limited, to this paragraph. We reserve the right to comply with law enforcement requests or requirements relating to your use of this website or information provided to or gathered by LABROS RESTAURANT and its affiliates with respect to your use of this website. If any provision of this agreement is determined to be invalid or unenforceable pursuant to applicable law by any court of competent jurisdiction, the other provisions of this agreement will remain in full force and effect. You agree that no joint venture, partnership, employment, or agency relationship exists between you and LABROS RESTAURANT as a result of this agreement or use of this website. This agreement (and any other terms and conditions referenced herein) constitutes the entire agreement between you and LABROS RESTAURANT with respect to this website and it supersedes all prior or contemporaneous communications and proposals, whether electronic, oral, or written, between you and LABROS RESTAURANT’S with respect to this website. A printed version of this agreement and of any notice given in electronic form shall be admissible in judicial or administrative proceedings based upon or relating to this agreement to the same extent and subject to the same conditions as other business documents and records originally generated and maintained in printed form. Where we promote third party goods or services on the LABROS RESTAURANT website we can accept no liability for those goods or services. Where you are buying goods or services provided by third party suppliers you should satisfy yourself that you wish to purchase those goods or services before contracting with the third party supplier. Please check the relevant third party supplier’s individual terms and conditions before purchase.